Korean BBQ at Tahoe Galbi. Let’s be honest: The Bay Area has nothing on Los Angeles when it comes to Korean food. San Francisco’s Koreatown dwarfs in size to LA’s, and while there are pockets of mouthwatering Korean restaurants in the South Bay and Oakland, Los Angeles simply has more. So it was with great anticipation that I visited Tahoe Galbi, located in Los Angeles’ Koreatown with a group of colleagues. Tahoe Galbi bills itself as an all-you-can-eat barbeque restaurant, which, if you’re familiar with Korean barbecue, can be a very dangerous thing for your waistline. Sure, Korean food is healthy, but endless plates of meat? My stomach says yes, but my pants say no. 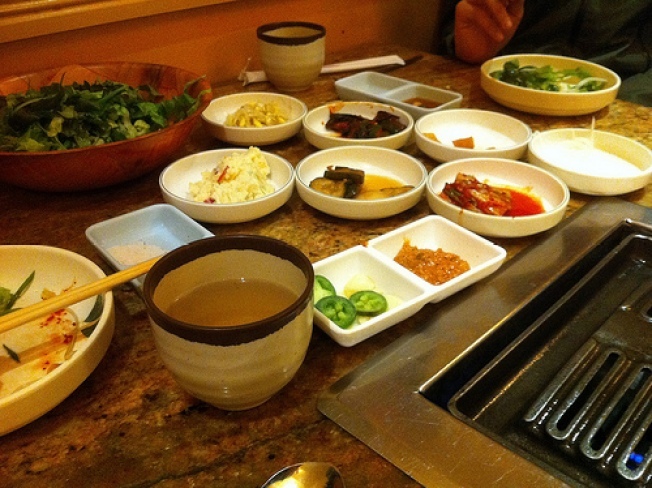 We nibbled on small plates of banchan while we waited for our first plate of meat to arrive. I went for the fish cakes and pickled cucumbers, my favorites. Our plate of thinly-sliced rib eye soon arrived, and we grilled at the table, dipping into our bowls of chili bean paste to season the meat. A bite of rice here, a mouthful of steak there, and I was in heaven. While we mostly ordered red meat, we opted for a plate of shrimp and baby octopus as well, which were very good. The shrimp in shell were messy but just perfect dipped in tiny plates of sesame oil and salt. We shared a couple more plates of steak before moving on to pork belly, which was a first for me. I tried a bite and was surprised by the super rich flavor, which paired well with vinegary, spicy kimchi. My favorite, however, was the tender, marinated bulgogi beef. Tahoe Galbi gets very busy, so service is accommodated by a buzzer at each table to signal for a waiter each time one wants to order something new. Want some more banchan? Buzz. Another plate of ribs, perhaps? Buzz. 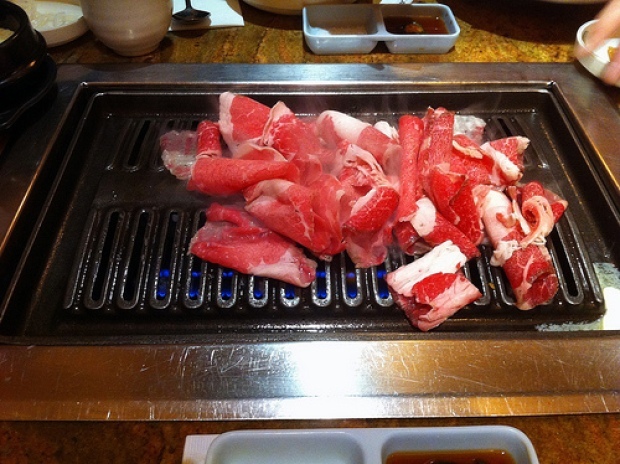 I left Tahoe Galbi wishing we had an all-you-can-eat Korean barbecue restaurant in the Bay Area. Although I’m not sure how much self-control I could exercise living so close to one, so maybe it’s a blessing in disguise. It’s a good thing Los Angeles isn’t too far away.